Well, this site is still under construction, as much as my forthcoming series is still a WIP. And I marked it a “writer’s site”, because as long as this series isn’t finished and published, I won’t be called an “author”. But, something should be presented here, don’t you think? 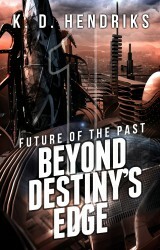 So, here it is, a sneak peak of the cover, the first part of my Trilogy, Future of the Past: Beyond Destiny’s Edge. I pondered a long time if I should publish this first of a series, although the series isn’t written in full. And decided against it. This SciFi story won’t be out in the open, as long as I still fiddle with parts of it, and as long as I haven’t written the last and final word – the end – of my debut. The decision hasn’t been easy, but I prefer to present the Trilogy in full. Nobody should have to wait for the availability of the next part. Thus, if this book is published and will meet your taste, if you, or any other reader is inclined to read more of Jasen’s story, more than the first part of the Trilogy, on to the second and finally the third, it will be available, then. If you’re interested in getting a notification from me as soon as I hit publish, so that you will be able to look up the books, inform yourself; use the ‘look inside’ at Amazon, or at any other ebook retailer, leave your email behind. You won’t get any other email from me, but one to inform you that there is a new ebook available. So. That’s it. Go elsewhere. Nothing more to find here.